On the pavement outside Marwoods there’s a big chalk mural announcing the gig’s running order – and various pictures of sea creatures in Santa hats. This actually succeeds at drawing in some of the passing Friday night punters, even if they don’t all stick around. We’d hazard a guess that not everyone was prepared for the jubilant oddity that lay within. 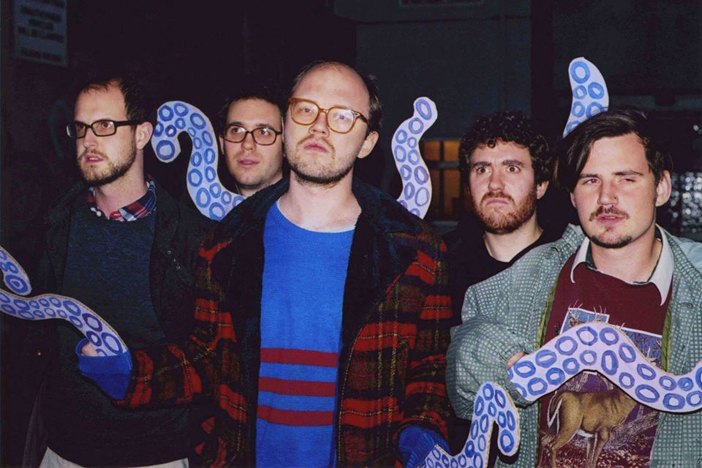 Whereas some bands make a point of letting their hair down for a fun and frivolous festive gig, Brighton’s Octopuses are usually f’ing it up most of the year round. Besides, the hair in this band is mostly face-based. First, though, we get a muted but otherwise convincing support slot from James Kemp And The Willing Gales. The limited PA set-up can’t quite cope with the demands of the band’s seven-piece line-up, and the unamplified sax players (for there are indeed two of them) threaten to smother the lead vocal and violin parts. We learn that the band actually has an eighth member, a cellist, whose excuse for being absent is the most glamorous we’ve heard in a while: they’re doing a panto in Hull. Despite all this, the Willing Gales’ set shows real promise, especially given that their first gig was only six months ago. Working with a mix of gypsy theatrics and Belle & Sebastian style storytelling, the folk troupe have already got at least two genuine hits under their hats – not counting their jazzed-up major key version of ‘Walking In The Air’. Octopuses have barely got going when frontman Adam Bell begins berating the guitarist for cocking up the first number. “It’s the Santa beard,” the latter protests. “I can’t see what I’m doing!” Always endearing and sometimes shambolic, Octopuses combine lo-fi keyboard hooks with neatly interlocking guitar parts and carefree Pavement-esque earworms. Though the band includes two former members of twee-prog trio Foxes!, you might not spot the connection were it not for the offbeat humour of the songs. Poised between goofy irreverence (“Come and have a go on my bouncy castle…”) and sardonic irony (“I don’t want to hurt you, I just want to make you cry…”), Bell’s lyrics are nonetheless delivered straightfaced – a good foil for the bizarre semi-rapped interludes of second singer Tom Matthews. Towards the end of the set we’re promised a medley, but two chords in they change their mind and instead play a newly-penned seasonal song which comes off as surprisingly sincere, despite the cocaine metaphors. Then we get ‘Cool Story Bro’, the band’s most coherent song to date, an electro pop ditty with a proper groove and a repeat chorus that brings the marine theme full circle with its “bottom of the ocean” refrain. In lieu of defining Octopuses’ charm, let’s just call it fun.